A young pregnant Pit Bull mix found herself in a high kill shelter last month and as the saying goes, one good turn deserves another. This mama ‘to be’ was rescued from euthanization, when pulled by The Ark Animal Rescue, a non-profit animal rescue, based in Oceanside, California. 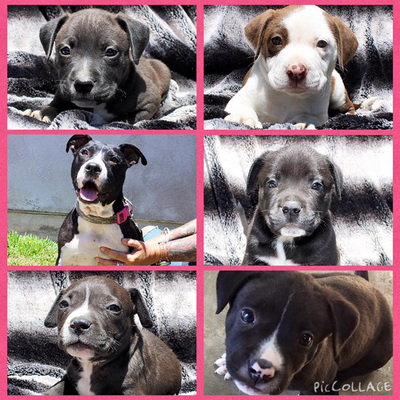 She was named Annie and soon gave birth to five perfectly healthy pitty puppies while in foster care. Not long after rescuing Annie, the The Ark took in 4 Poodle puppies whose mama had sadly died. They decided to see if Annie would want to help out these orphan pups and she did. 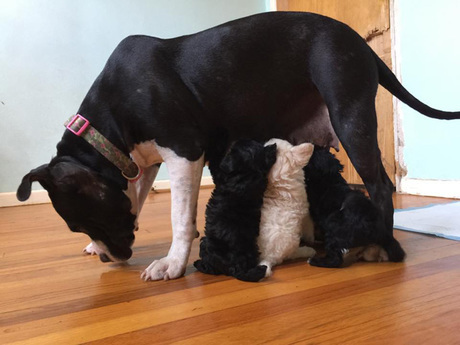 She immediately accepted the poodle puppies like they were her very own. Annie and her lab/pit mixes are ready for adoption. Please contact [email protected] if you’re interested in adopting. Pit Bulls are constanting taking heat and getting bad press. Those who have loved a Pit Bull know that the breed is not flawed, the humans who seem attracted to the breed are. Pit Bull lovers want people to know that stories like these are a testament to the breed’s true nature. Thank you IStillLoveDogs.com for posting this story!